"A favorite recipe from my friend Kathleen. This is a quick and easy way to make a flavorful appetizer or a tasty side dish. I take them to office gatherings or serve as a side with a main meal. Everyone loves them. I don't like pickles, but I love these pickled carrots! You can substitute sucralose sweetener (such as Splenda® for the sugar." Bring a large saucepan of lightly salted water to a boil. Cook carrots in boiling water until tender but not mushy, about 15 minutes; drain. Stir sugar, vinegar, and cloves together in a saucepan; drop in cinnamon stick and bring mixture to a boil. Stir until sugar dissolves. Transfer carrots to a bowl and pour syrup over carrots. Cover tightly; refrigerate until chilled and flavors have blended, 3 hours to overnight. See how to turn fresh asparagus into delicious homemade pickles. These are just fine, but they tasted better the next day as opposed to just after 3 hours. More time = more developed flavor. no I did not make any changes. They were really bad. This is an awesome recipe. 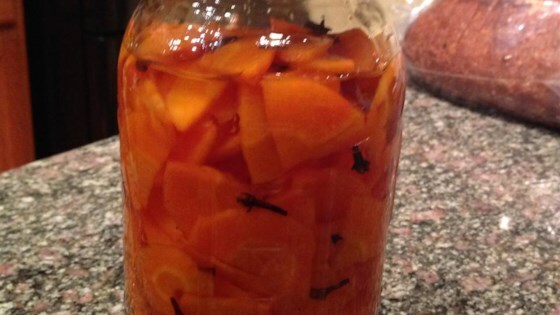 Even those who don't like pickles will love this recipe!! Give it a try . . .You're going to love it!